From high fashion to practical outdoor gear, alpaca products are making their mark. Our focus is to provide high quality extremely warm Canadian and Peruvian made alpaca products suited to our Canadian climate. We selected our business name, Alpaca Tracks T(h)read Lightly as we are aiming to produce a high quality product in an environmentally and socially responsible manner. 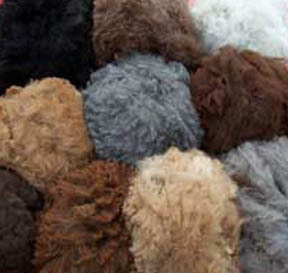 We are utilizing home grown alpaca fibre as well as incorporating traditional local skills and knowledge in the production of our end product from rovings and yarn to duvets. We also import fair-trade items from Peru with the intent of keeping the wealth of traditional Peruvian artisan knowledge and practises alive. Our goal is to move people away from “fast fashion”, a mass produced highly disposable product. I have always admired these animals from a distance. One sunny afternoon, Corinne and I decided to go visit an Alpaca farm near Kemptville. It was love at first sight. These animals are just so unique in appearance as well as in the individual personalities that they foster. As alpacas are native to Peru, we really wanted to travel there and see these animals in their natural environment. We certainly weren’t disappointed. There were Alpacas everywhere and such a beautiful variety of Alpaca products being sold along roadsides, in local markets and in larger co-op type markets. The first time that a young child asked, “picture?? ?” Corinne and I were delighted to have our pictures taken with an alpaca and proud child. I think the alpaca had a better coifed top knot than my own wind-blown one. After many of these Kodak moments, we returned home with quite a selection of Alpaca pictures and products. Shortly after our trip to Peru, I discovered www.alpacaseller.ca. 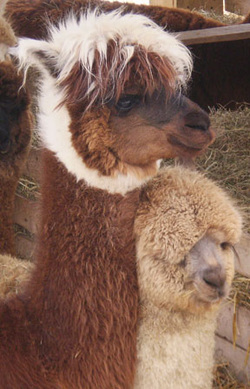 I can not begin to tally the number of hours that I spent on that website looking for the perfect alpaca. Well actually I was looking for two as they are herd animals and become very lonely in a solitary existence. Interestingly enough, I found “the perfect alpaca”. Her name was Aphena. Best of all, she was living at Rosedale Meadow Alpacas just outside of Smith Falls. So one Sunday afternoon Corinne and I ventured out to try to see if we could find Aphena. Without prior warning to the owners, we found ourselves at the Rosedale Meadow Alpaca farm on the coldest, windiest day of the year. My newly purchased Peruvian baby alpaca hat managed to keep my head warm as we spent a very informative couple of hours talking to Jim about alpacas. Aphena turned out to be everything that I had hoped for and then some. Despite that innate desire to farm alpacas, we did not buy any animals at this time. I left Rosedale Meadows absolutely convinced that one day Alpacas were going to adorn the front lawn. Periodically I would visit Alpaca Seller to make sure that Aphena was still there and she was. After subsequent visits with Jim and Sharron, one Sunday evening I found myself on-line while sipping on a glass of wine. The result was that we had a deal which included Aphena and eight other alpacas. Three were pregnant and about to give birth in the spring. Even though I am thrilled with this business deal, I repeatedly tell people, never go on line while drinking wine. As I type this, I am pleased to share with you that Aphena has since had a true black female cria and we have named her Y”AREQUIPA (you’re a keepa). When Auroa gave birth to a beautiful completely brown female cria, I wanted to call her Y’AREQUIPA 2 but instead we have settled on Rosita (Rosie) named after a charming little five year old that I met at the orphanage in Arequipa, Peru. Our love for alpacas and our trip to Peru have woven a very special connection. That is how we decided on a herd name: Alpaca Tracks-Peruvian Connection and inspired by our commitment to minimizing our footprint while supporting the orphanage and various Peruvian artisans our motto is T(h)READ LIGHTLY.